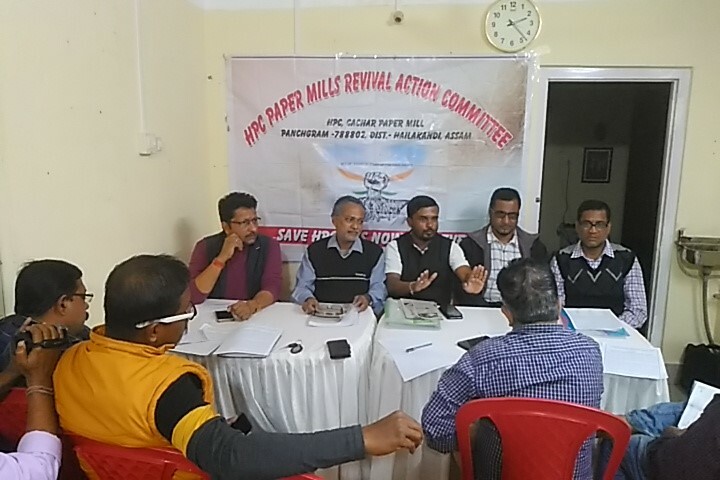 Accusing the central government of conspiring to sell off both the HPC mills in Assam, HPC Paper Mill Revival Action Committee, called upon both state and central governments to come out with actual facts on these two mills. Demanding to know as to whom they (the governments) are selling and at what price, members of the committee alleged that when the state was reeling under the heat of protest against Citizens Amendment Bill, the central government was trying to sell off these mills through the back door. “A tender was called for on 24th of September last year to sell off both these mills as well as other assets at a base price of Rs 750 crores. Value of both these mills would be in few thousand crores of Rupees. It is surprising that the Central government wants to sell these mills at a throw away price. “Who are all those players and what is their interest in getting these mills sold, should come out before the common public” said, Manabendra Chakraborty, Chief Convener of HPC Paper Mill Revival Action Committee. Chakraborty also alleged that a business tycoon from Gujarat, who is close to Prime Minister Narendra Modi, has shown keen interest in buying these mills. “A report too has been asked by the centre to be prepared latest by 31st of January enlisting the assets and its valuation of both these mills. Many leaders, ministers, MPs are aware of such move but are keeping mum owing to the forthcoming elections,” said Manabendra Chakraborty. He added that the Prime Minister and his office had assured of reviving these mills through official letters sent last year, but the assurance was of no use now as the government was conspiring to sell off both these mills.